An early morning, early March walk reveals surprising delights. • Colors: the muted greys and browns of late winter are ever-so-slowly giving way to hints of green and glimpses of brighter colors. 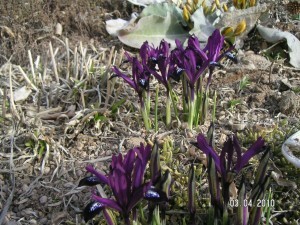 How can you see purple Iris reticulata next to brilliant yellow crocuses, and not feel a surge of hope? The Water-Smart Garden is one of the first places to show new color, with the Rock Alpine Garden not far behind. 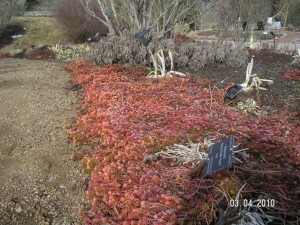 You’ll also want to admire Sedum angelina, one my of all-time favorites. This time of year it really shines in red, orange, lime green and yellow. Find it in the middle of the Lilac Garden, as well as along the paths in the Romantic Garden. • Textures: Dryland Mesa never ceases to amaze, with an astonishing array of form and color. 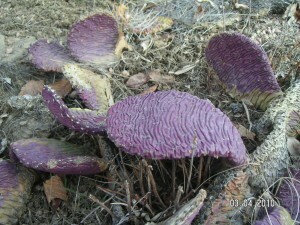 Check out Opuntia aurea which, despite its name—aurea means gold—is a rich, crinkly purple this time of year. Also see the cactus labeled Opuntia sp., with its long spine and pale green body. 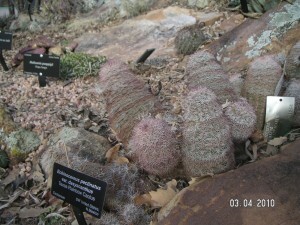 Numerous other hardy cacti and succulents await your inspection in this garden. • Favorite lunch spot this week: On a cool, sunny day, there is no better lunch spot then a bench on the Green Roof. Bask in the rays and enjoy the view. The Green Roof Garden is great looking this time of year, with its mix of xeric succulents, grasses, and spreading groundcovers. • Couples: A pair of geese look like they are ready to make a home here at the Gardens. We discourage geese, since they eat a lot of plants! Ducks, on the other hand, are welcome. Crow couples are collecting grasses for their nests, and leafy squirrel nests stand out in the bare trees. I always hope to see our foxes, but so far this year, I’ve caught only one glimpse, back in December. • Gardens to spend time in: Wander out to the west end of the Gardens, and enjoy the tranquility of the Gates Montane Garden and pond, and, of course, the Japanese Garden. Be sure to stop by Dryland Mesa, and pause to watch our new greenhouses rise. ‹ Previous Article: Anything but drab! Spanish draba (Draba hispanica) is always first to bloom.